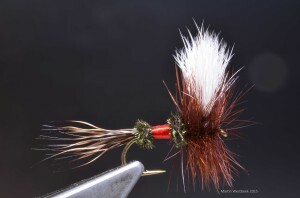 Wulff flies date back to 1929 but they still are great flies, or rather: style of fly. 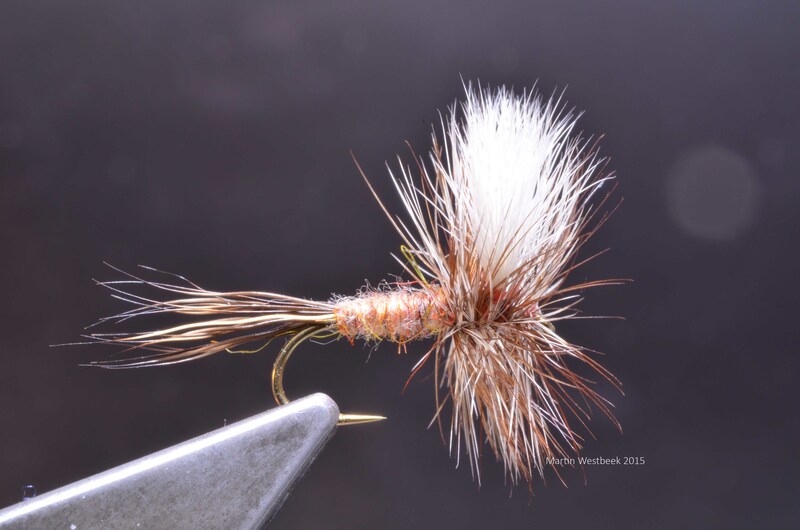 Heavily hackled or sparse, with a dubbed, floss or thread body, natural or bleached Elk… Wulffs are still going strong! Lay a thread base on the hook shank and tie the Elk (20 hairs or so) on top of the hook. 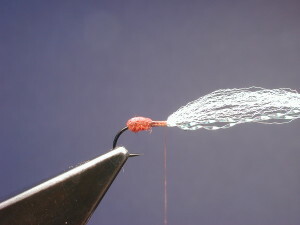 Tighten the thread by pulling up, not down or the hair may be pulled to the far side of the hook. 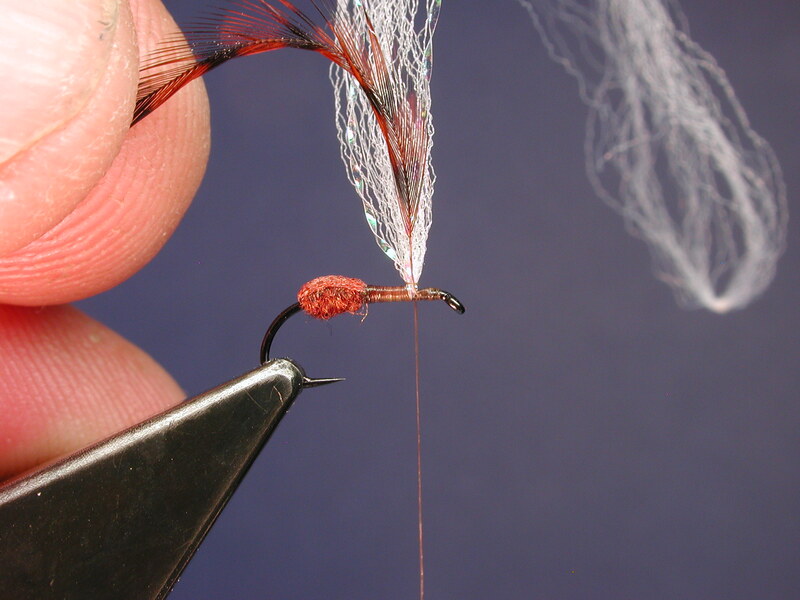 Divide the wing, make three thread wraps around the base of each wing to separate the wings. Make the thread wraps firm, not tight or the hair will flare. Tie in tail (10 Elk hairs or so) Make the first wraps tight then ease to firm as you make your last wraps. Tie in yellow thread behind the wing, twist the thread counterclockwise to flatten it. 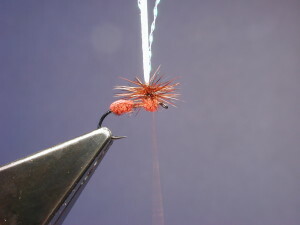 Wrap to tail and back up again. 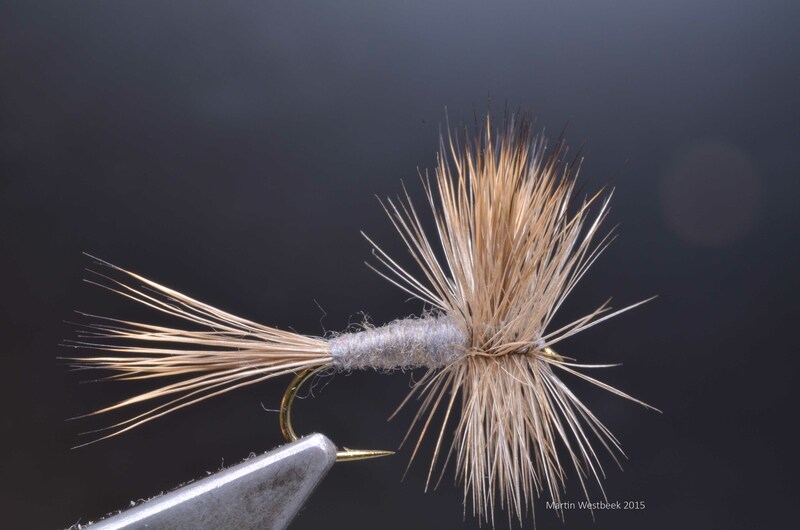 Tie in hackle, dull side up. 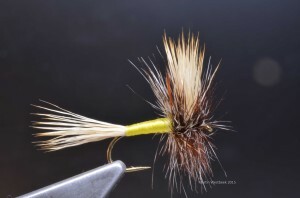 Note the bare stem at tie-in point and thread slope to the eye. The bare stem will result in a nice first wrap of the hackle without any stray barbs; the thread slope is a gradual taper to the hook eye, which helps hackling. 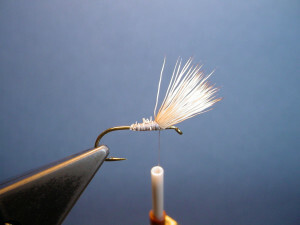 Wrap hackle (3x behind and 3x in front of wing, whip finish and varnish head. During the warmer months of the year, they are just about anywhere… Ants. Early in the season flying ants swarm, and many are blown into the water (upslope blow-ins). Later in summer ants will be on leaves and in branches of streamside vegetation, looking for food. They live in dead trees by the streams, and lots of them drop into the water. In these ants trout and grayling have a constant supply of food. 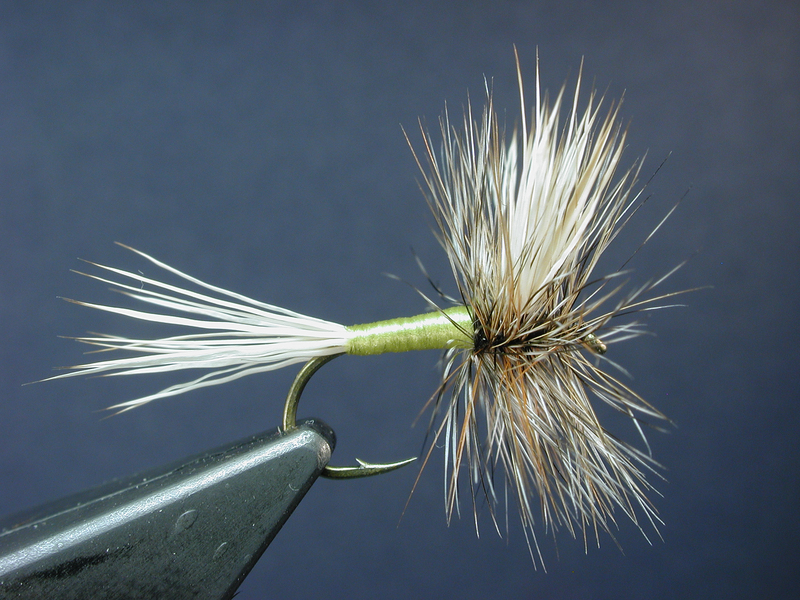 So whatever hatches, or if no hatch comes off at all, or if you’re fishing in the heat of a summer day… an ant is a useful thing to carry. Many ant patterns are made of foam. 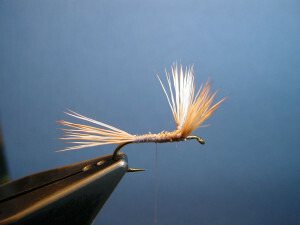 They look great, and are easy to tie as well. The problem with these foam ants, however, is that they are high floating flies. 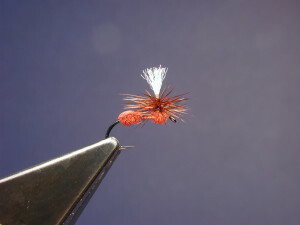 Real ants only float for a brief moment and then they slowly sink. 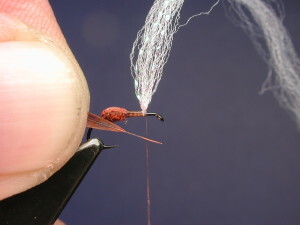 Enter the parachute ant: a low-riding parachute ant with a submerged body and a post of poly yarn and two strands of pearl Crystal Flash for visibility. 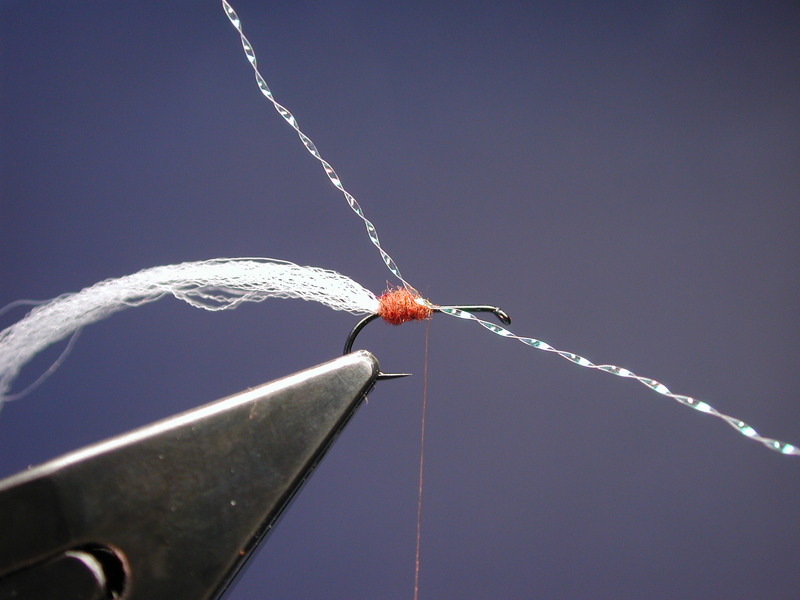 Start the thread at the midpoint of the hook shank. 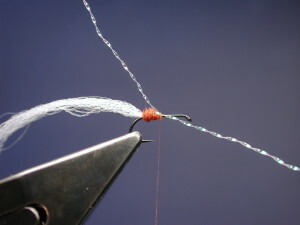 Tie in a length of polypro yarn (diameter not more than the outside diameter of the hook eye) extending over the bend until right above the barb. Basically, an ant body consists of three different parts: the abdomen, a very thin waist and a thorax/head that’s slightly smaller than the abdomen. Dub the abdomen in the shape of a rugby ball. 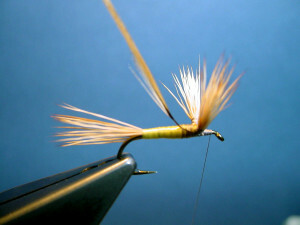 The size of the abdomen is about 1,5 times the distance from the barb to the hook point. Keep plenty of room for the tiny waist. 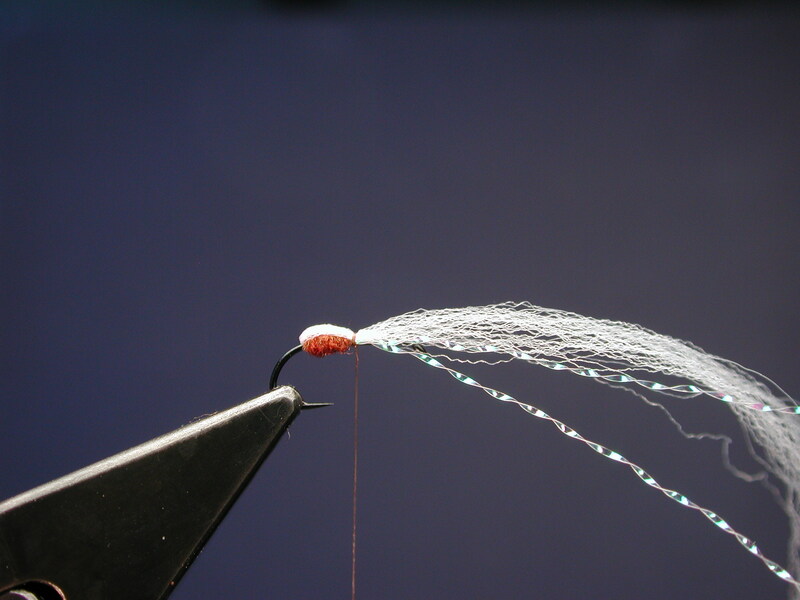 Tie in one strand of pearl Crystal Flash. 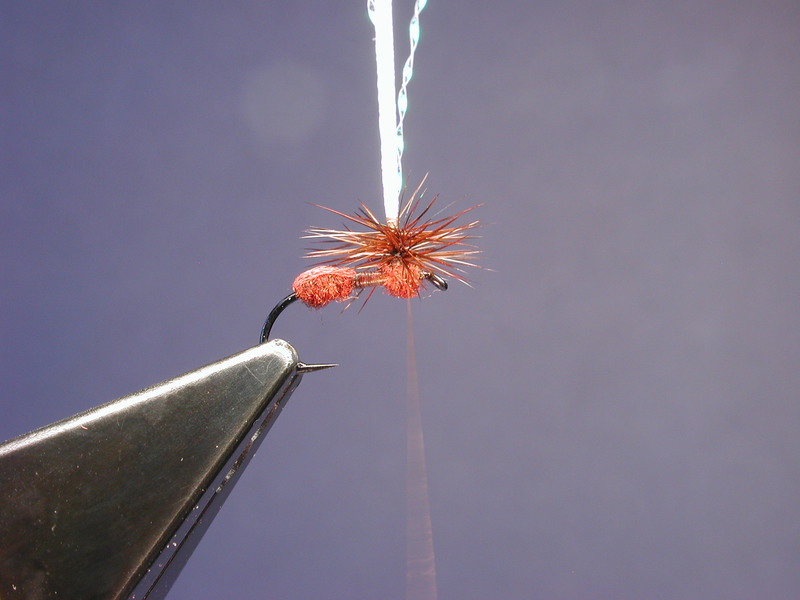 Fold the poly yarn over the abdomen, Humpy style. 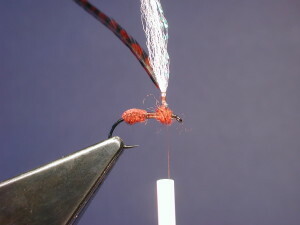 Stop the waist 2 mm shy of the hook eye, make a couple of wraps in front of the post. 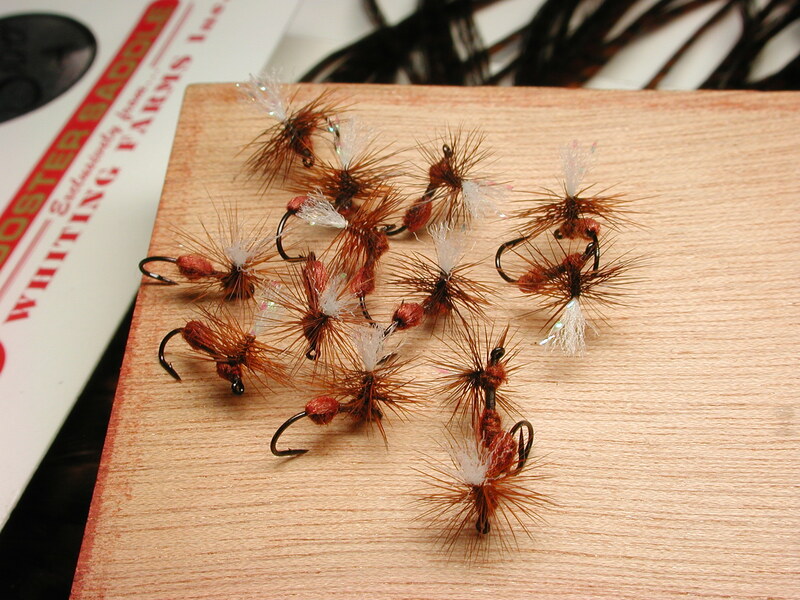 Select a hackle and strip some of the barbs. The distance of the stripped quill should equal the distance from the hook eye to the post, plus the height of the body, plus the height of the parachute. 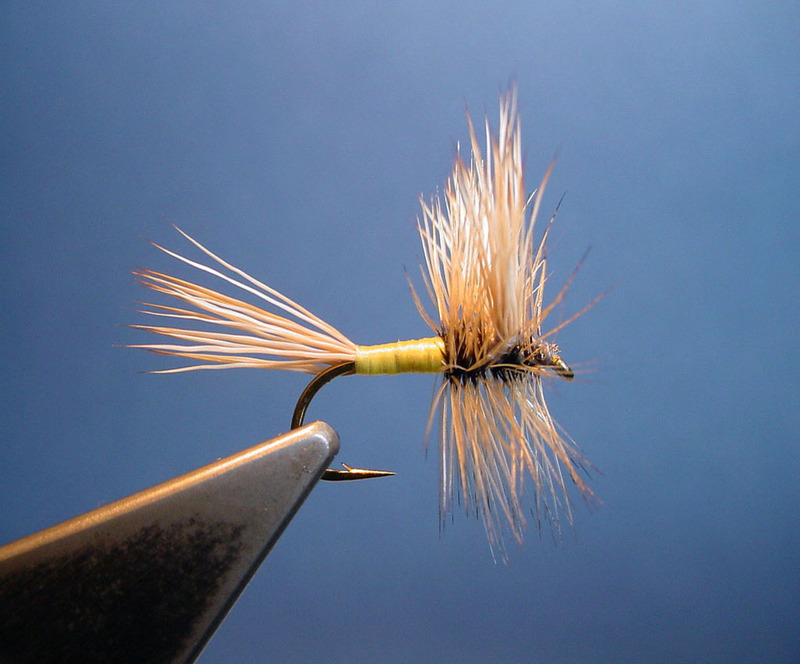 Tie in the hackle right behind the hook eye, and wrap towards the post. Wrap the hackle up against the post, and wrap down again. Dub the thorax/head behind and in front of the post. It’s a little smaller than the abdomen. Leave the thread in front of the parachute post, your side of the fly. Hackle the parachute down to the thorax/head. 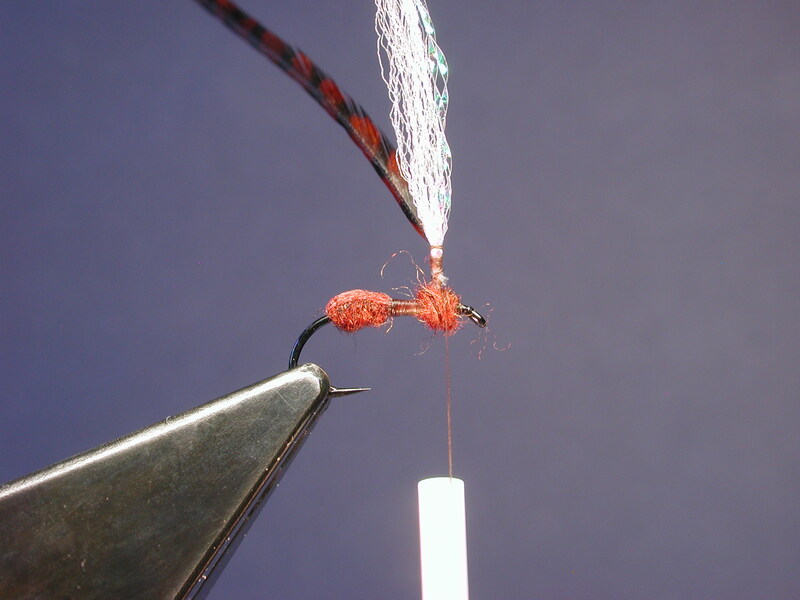 Because you’re hackling around a small diameter post you may want to make 5 to 7 wraps. Make three to four thread wraps to tie off the hackle. 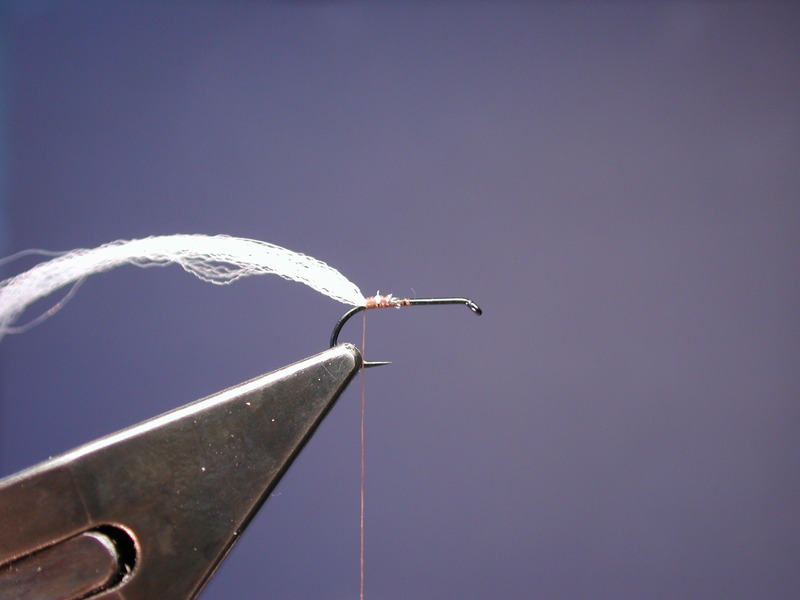 Try not to trap too many barbs, so keep your thread wraps below the lowest barbs. 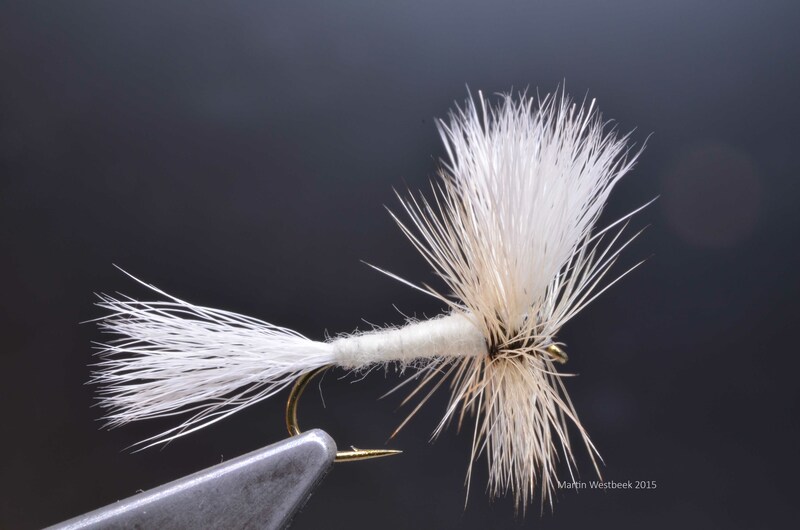 Clip the hackle. 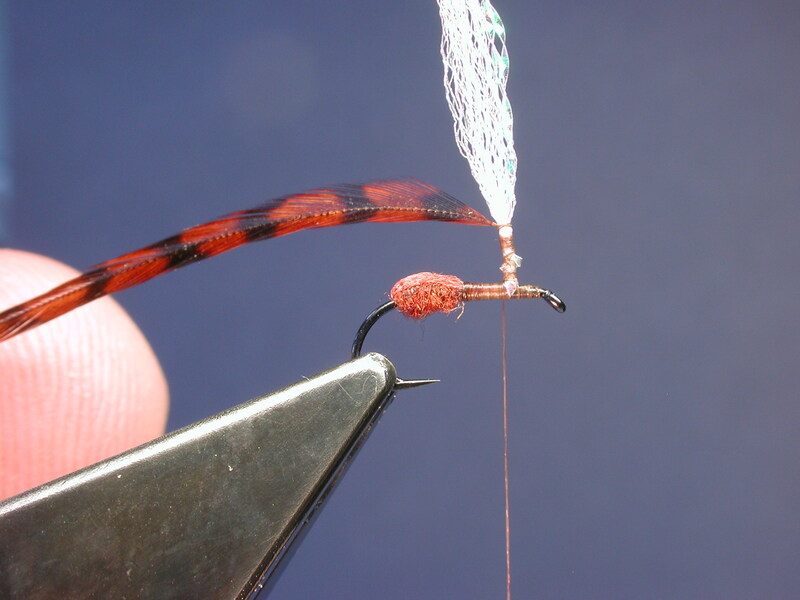 You can make a whip finish around the parachute post, but on a small hook like this #17 this is hard. To me anyway. I make a reversed whip finish (making turns towards me) behind the eye. 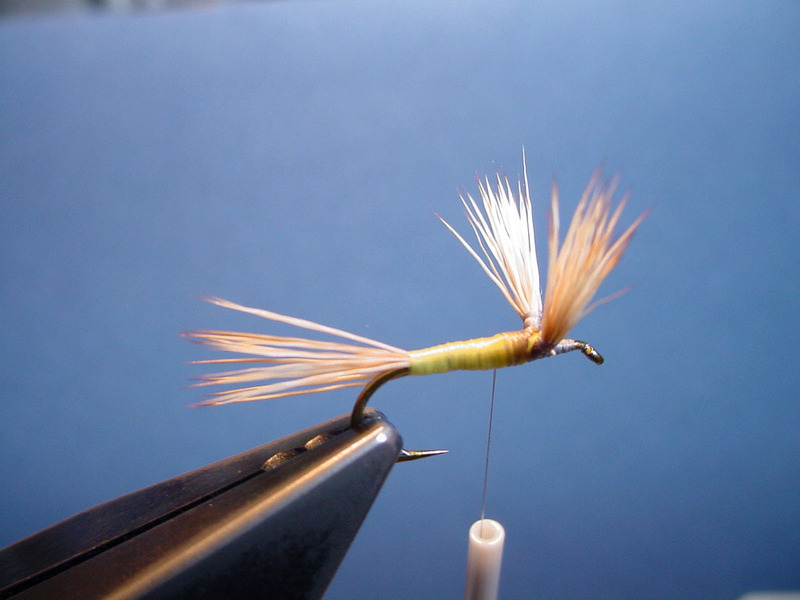 This prevents the thread being pulled under the dubbed abdomen/head. Clip off the post to desired length. 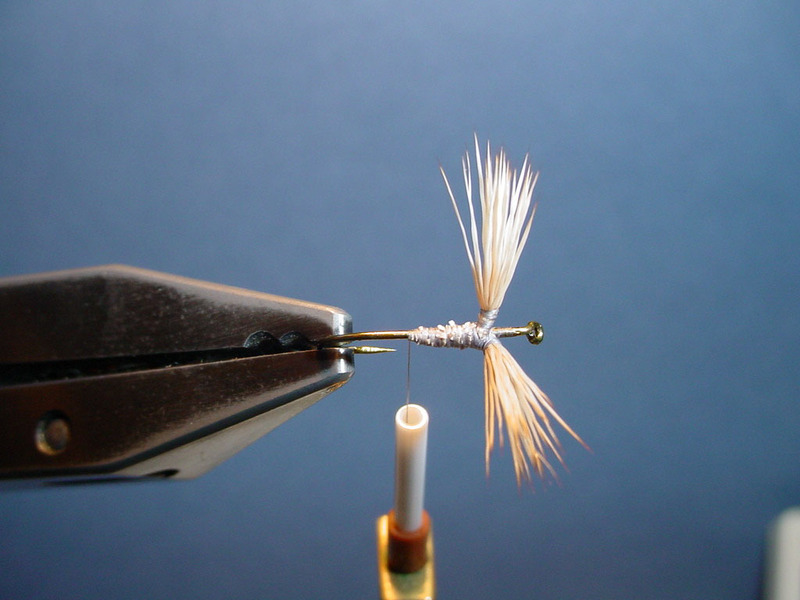 Put a tiny drop of CA glue on the whip finish and on the spot where you tied off the hackle, and you’re done! 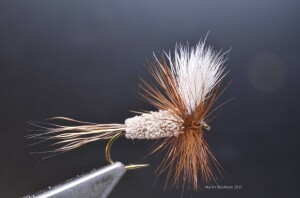 Sometimes trout seem prefer a sunken ant. 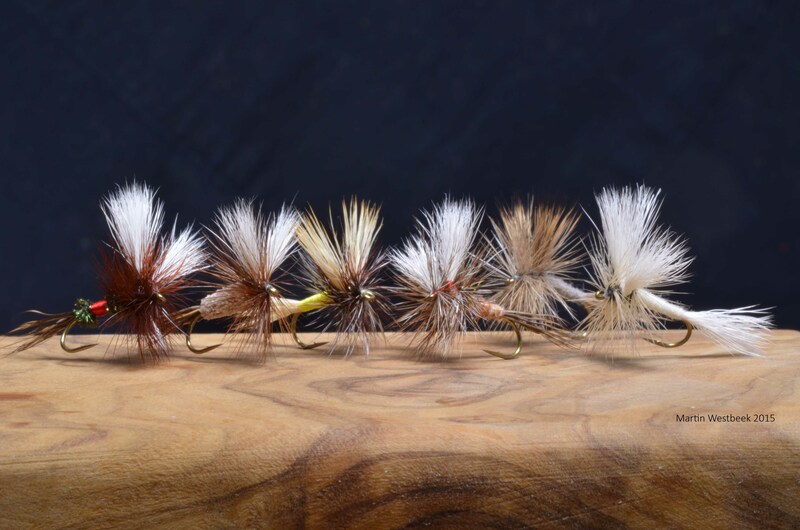 In that case, or if you come to a deeper spot where you just know that there should be a fish down there, simply modify the fly. Clip off the parachute, put a split shot on the tippet, some 30 cm from the fly, and see what happens.